This is likely the most important part of the tree fort build. If you don’t start with a good and level platform, it will create issues later. At this point, I have already picked the tree. I decided on the red oak that has a 5′ to 6′ trunk circumference, and there are also no branches on the tree for at least 20′. In addition and coincidentally, the tree is at the perfect location in the yard…not directly in view of the neighbors or from inside our house. Having selected my ‘rock’ so to speak, the first task is to attach the two lower beams to the tree. The two lower beams run parallel to each other in one direction, then the second set of beams, the upper beams, will run in the opposite direction on top of the lower beams. All (4) of these beams I attached with 1/2″ x 9″ galvanized lag screws. 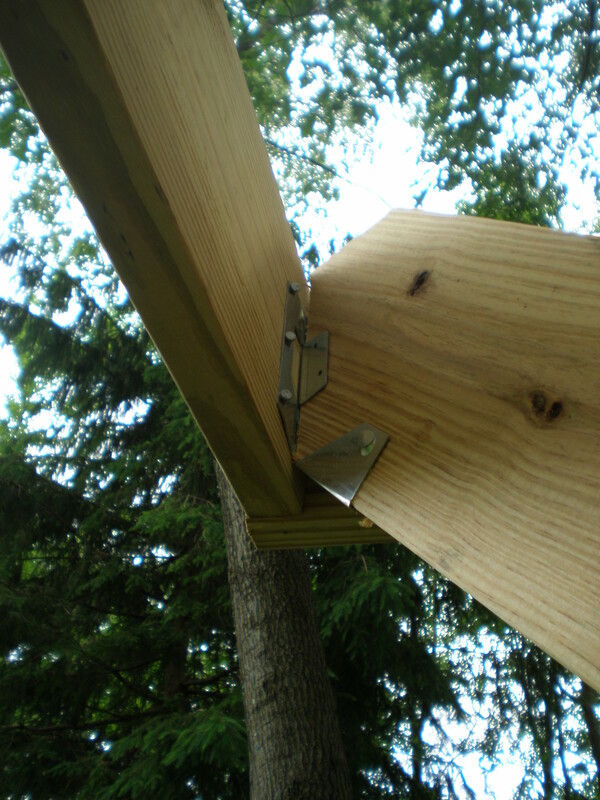 To provide space between the beams and the tree (allowing for growth) I used two 1/2″ galvanized washers on the tree side at each of the lag screws. 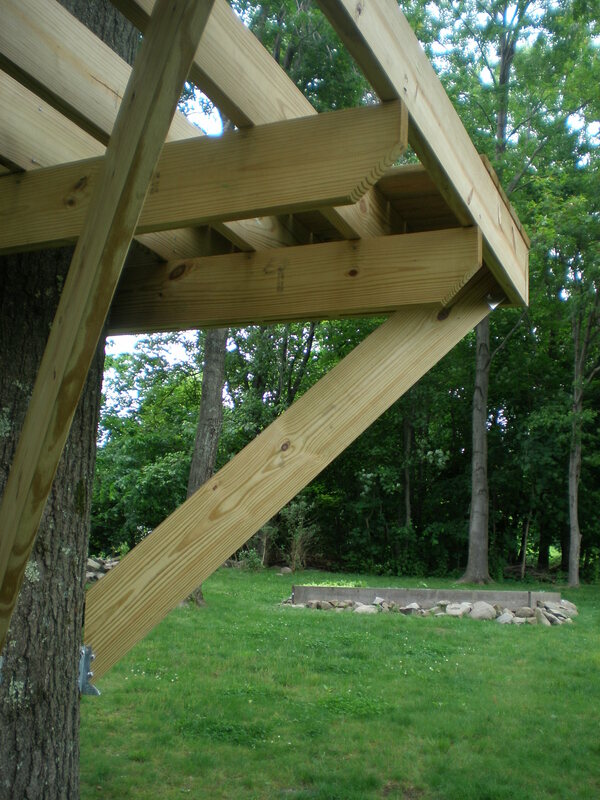 My lower beams are 8′ in length, which was a little difficult to handle at times, as I was mounting them by myself. Fortunately, I was able to rest the lower beams on my step-ladder while I figured the exact location for the lag screw. I used a 16d common nail inserted into the tree just to help support the beam while I marked out the location for the lag screw. Note that the lag screws are purposely offset of the center of the beams width. This was a detail pointed out as high importance in the Black & Decker book. 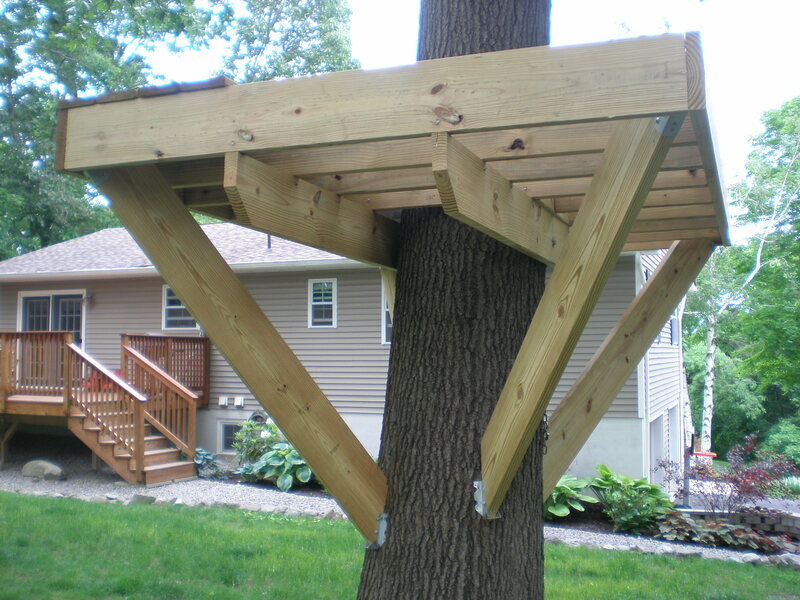 There is a lot to think about when attaching the lag screw, and it depends upon what type of tree you have and what type of tree fort you will build. This is one of the points I was not comfortable deviating from…so I went by the book. Once the location was marked, I pre-drilled for the lag screw, and used a socket wrench to tighten the lag screw. However, once the lag screw made it’s way into the old growth of the tree, I could not get enough force behind the wrench. A few sore muscles later, and a smack to the forehead…followed by “duh”, I realized I needed some more leverage. Therefore, I slipped a pipe clamp onto the end of the socket wrench, and was then able to tighten up all lag screws with ease. I repeated the process attaching the upper beams to the tree. This time I was able to use the lower beams as support while marking out for the lag screw on the upper beams. The most difficult thing to do during this task was keeping everything level. With just one lag screw in each beam, the beams are still able to move around quite a bit. Things didn’t really stop moving until the rim joists and knee braces were attached. This was something of a surprise to me…I thought I had done something wrong when I attached the lag screws. Now I know, this movement is fine. It might be a good idea to insert some shims during the beam attachment step…this might prevent some movement while the frame is being built. However, I can tell you from experience, it can be done without. I cut my rim joists to size and then came up with a plan to attach them to the upper beams. I am building by myself, so I had no one to hold the rim joist in place while I nail. I found a scrap of red oak I had lying around in the shop and clamped it to the bottom of the upper beams so as to basically create a shelf to rest a board on. I set one of the rim joists on this board, and nailed it in place using 16d galvanized common nails. I repeated for the opposite side. The end rim joists were a little easier…I just had to set them on top of the lower beams while I nailed them into the side rim joists. The only difficultly was that I had to counterweight the joists with the joist on the other side as the whole platform would tip in my direction. I filled in the rest of the joists at 12″ on center. After completing all the joists, the platform still had some movement. This was a big concern of mine, as I stated earlier in this post, until I attached the knee braces…they really solidify the foundation. To build the knee braces, I cut a 45 degree angle on one end. I set the board on the corner of the platform, and then I measured from the corner of the platform to the tree trying to keep the board at 45 degrees. I used a bevel gauge at the tree side of the board to get the correct angle to use when cutting the board to length. In case you are wondering, none of the boards hit the tree at 45 degrees…too much irregularity in the trunk. I used adjustable joist hangers to attach each knee brace to the platform. They help to make up for any irregularities, and they help to make great contact of the knee brace to the platform. 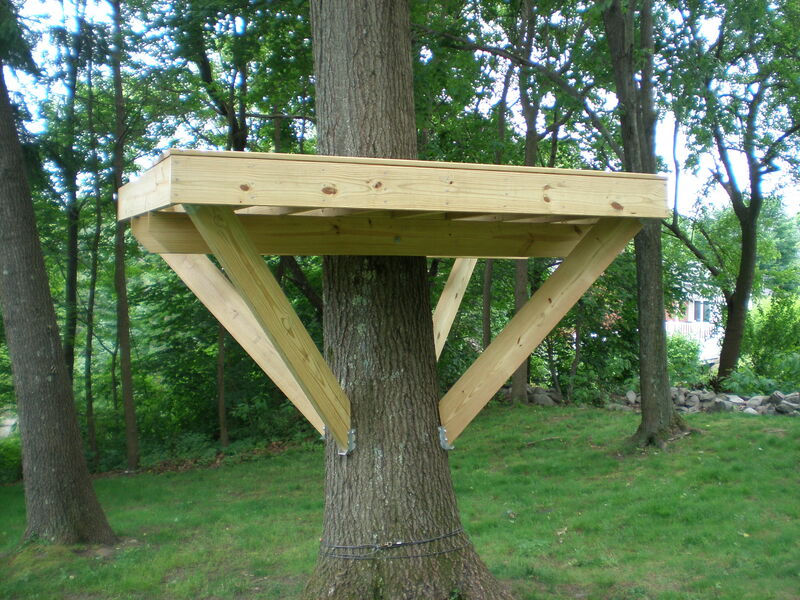 On the tree side of the board, I used simple joist hangers. Due to the shape of the tree and the slight lean that the tree has, some of the knee braces are longer than the others. There are most likely no two the same length…so don’t cut them ahead of time…each one needs to be custom fit (see photo below). To finish up the knee braces, I flush cut the top of the knee brace with the top of the platform. I started the decking as you can see in some of the photos, but I’ll leave that for another post…this one is growing far to long. 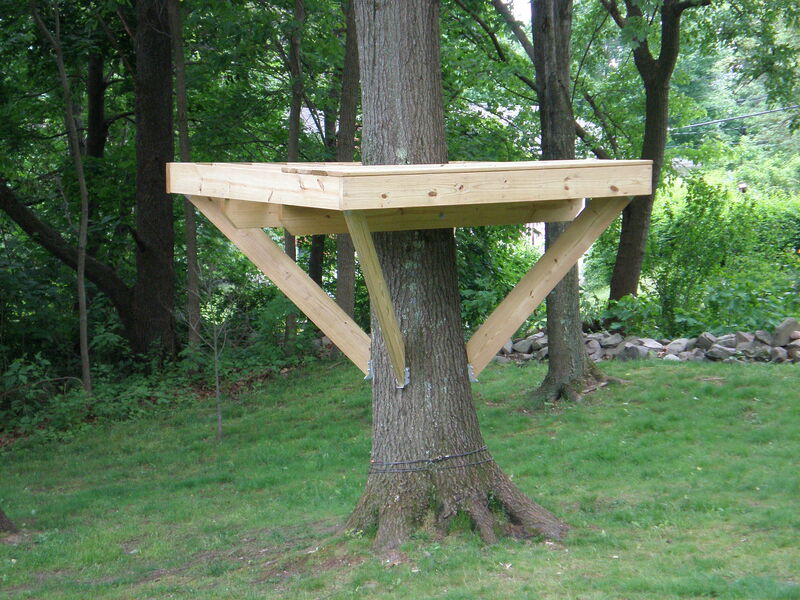 This entry was posted in hand tools, just for fun, tree fort, VCF, woodworking and tagged hand tools, tree fort, tree house, woodworking by villagecustomfurniture. Bookmark the permalink.